Spray for the relief of nasal congestion in children over 6 years and adults. The duration of action is 12 hours. It reduces swelling of the nasal mucosa and mucous membranes around the Eustachian tube, decreases nasal discharge and restores nasal breathing. Active components of essential oils presented in Noxprey facilitate to reduce the sensation of nasal mucosa irritation and protect it from excess dryness. Oxymetazoline, Noxprey active component, is one of the vasoconstrictors that has the maximum duration of action. Oxymetazoline exhibits antiviral, anti-inflammatory, immunomodulatory and anti-oxidative effect1. 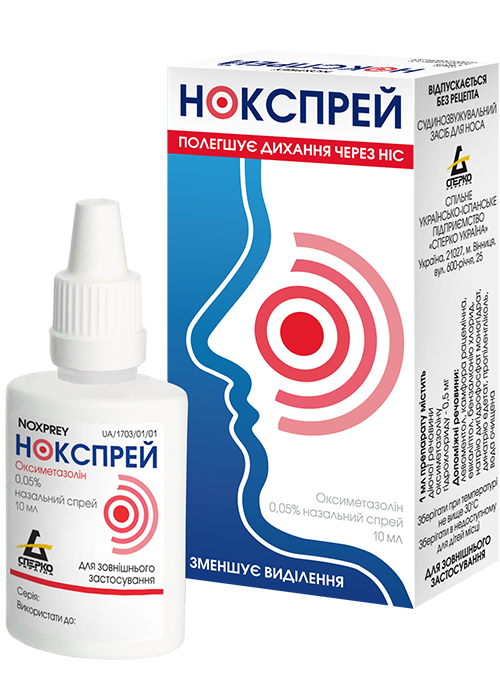 Noxprey is a long-standing leader among medicines for runny nose in Ukraine based on customer preferences confirmed by an independent research “Favourites of Success”. For detailed information on the medicinal product Noxprey, please see “Package leaflet” page. Marketing authorization of MoH of Ukraine No.UA/1703/01/01 dated 27.06.2014.